Sis and I had a late lunch at Madam Kwan’s, Bangsar Baru not too long ago. She ordered the Mushroom Chicken Rice while I had the Curry Laksa (Kuay Teow). 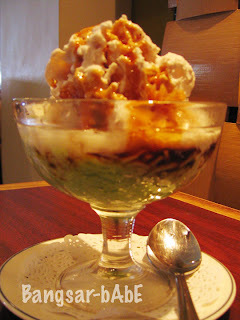 We also had a bowl of cendol to share. I had a spoon of the mushroom chicken rice. It was not bad. The chicken was well marinated and topped with two big, succulent mushrooms. Sis was quite happy with her food. 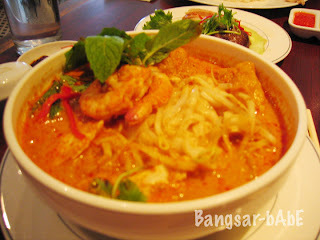 My curry laksa was mediocre. It was too ‘lemak’. I felt really ‘jelak’ after that. The cendol was OK-lah. Again, there was way too much santan and the ice shaving was too rough. I much prefer the cendol from SS15, Subang Jaya. And it’s cheaper too. 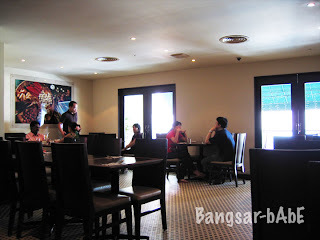 The bill came up to RM38.07 for the both of us. Rather expensive I must say. In a re-cap, this place serves average tasting ‘posh’ hawker food. That being said, I think it’s still better (and more economical) to eat at hawker stalls. Verdict: If you want to enjoy hawker food without having to endure the heat, this is the place for you.